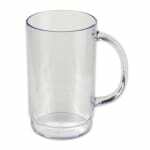 The GET 00083-1-SAN-CL beer mug is able to hold 20 ounces of liquid but has a rim-full capacity of 21 ounces. Product can easily be seen since the glass is transparent, helping other customers make impulse buys. The plastic construction of the GET 00083-1-SAN-CL beer mug withstands heavy, constant use. This unit is BPA free to keep consumers safe. To make cleaning simple, the mug can be placed in the dishwasher. Logo can be imprinted on the mug. Contact customer care at 1-800-541-8683 to specify. "I bought a case of these mugs for my family since they love the ones I sent them last year from my order. They are a large family so the 24 mugs..."
We use them all the time! "I bought a case of these mugs for my family since they love the ones I sent them last year from my order. They are a large family so the 24 mugs work out great for them."